Whether you’re a first time mom or you just had your fourth baby, you’ve found yourself on this page because you have a nagging feeling that being a mom just shouldn’t feel SO. DAMN. HARD. Being a mom is hard—there’s no doubt about that. And while you know no mom sails through motherhood unscathed, you’re unsure if the feelings you’re having constitute a normal amount of stress/frustration/exhaustion/sadness, or if you’re getting to the point where you need more support. You know yourself best. If you don’t feel like yourself and you or your partner are worried about how you feel, reach out for help. Any persistent feelings of irritation, anger, sadness, or worry that last beyond the first 2-3 weeks are a good reason to seek help. I am committed to helping mothers and their partners thrive, creating a ripple effect throughout their family, friends, and community. I know going to therapy can feel intimidating and scary, and it’s my life’s work to remove the stigma of seeking help so you can be your best self. I offer services in whatever way makes you most comfortable: in my office in Stapleton, in your own home, or Walk+Talk Therapy. I know you’re short on sleep and time, so it’s my hope that this page will simplify things for you. 1 in 7 Moms and 1 in 10 Dads suffer from postpartum depression. Symptoms can develop anytime from pregnancy up until your baby’s 1st birthday. You didn’t do anything wrong to cause yourself to feel the way you are feeling. While Postpartum Depression, or PPD, is becoming more and more well-known, the term does not adequately convey the fact that there are several other mental health disorders that can effect a new mother. For this reason, the term Perinatal Mood and Anxiety Disorders (PMADS) is being used. If you are experiencing any of these symptoms in the year after having baby, you might be experiencing postpartum depression. 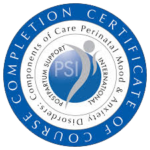 PPD is a curable condition that can be helped with a therapist trained in maternal mental health. Approximately 6% of pregnant women and 10% of postpartum women develop anxiety either by itself or in addition to depression. If you’re experiencing anxiety during pregnancy or in the postpartum period, I want you to know that you are not to blame and didn’t do anything to cause this. The anxiety is temporary and treatable by a therapist trained in maternal mental health. Out of all the perinatal disorders, Postpartum Obsessive-Compulsive Disorder (OCD) is the most misunderstood and misdiagnosed. It is estimated that 3-5% of new moms (and some new dads) will experience these symptoms. Research has shown that these images are anxious in nature, not delusional, and have very low risk of being acted upon. It is far more likely that the parent with this symptom takes steps to avoid triggers and avoid what they fear is potential harm to the baby. Approximately 9% of women experience postpartum post-traumatic stress disorder (PTSD) following childbirth. Most often, this illness is caused by a real or perceived trauma during delivery or postpartum. Maternal Mental Health affects the whole family. Often, Couples Counseling can be essential as you adjust to your new addition. Getting support as a new father can be imperative too. Nursing mamas and babies are always welcome.